Reticulated pythons are the longest species of snake in the world. As Singapore’s wild animals have increasingly less and less space to live in with increased urbanisation, many find themselves having to adapt living near to human habitations. Wild animals frequently find themselves stuck in people’s homes, or trapped on busy roads, often getting injured along the way. And this can happen any time, night or day. That’s why ACRES runs our wildlife rescue services 24 hours a day, 365 days a year, so we are always on hand to help wild animals in distress. Our Wildlife Rescue Hotline 97837782 is always busy, and the number of calls we receive each week is steadily rising. Rescued native animals are released straight back into the wild whenever possible, but sometimes the reptiles and amphibians need a period of treatment at the AWRC and are released back into the wild at a later date, once they are fit and healthy. ACRES collaborates with the National Parks Board (NParks) to find suitable release sites for all animals. Since the AWRC opened in August 2009, we have been inundated with calls to the Wildlife Rescue Hotline regarding native wild animals in need of help. Since the opening of AWRC, we have rescued and released back to the wild thousands of native wild animals, providing veterinary treatment where necessary. Species of animal rescued include the sunda pangolin, common palm civet, Malayan colugo, plantain squirrel, reticulated python, monitor lizard, hawksbill turtle, as well as numerous species of birds and bats. 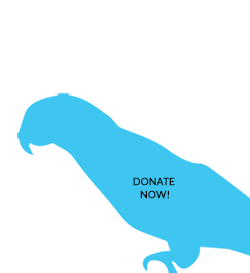 Here are just some of the native wildlife rescues that your support has made possible. 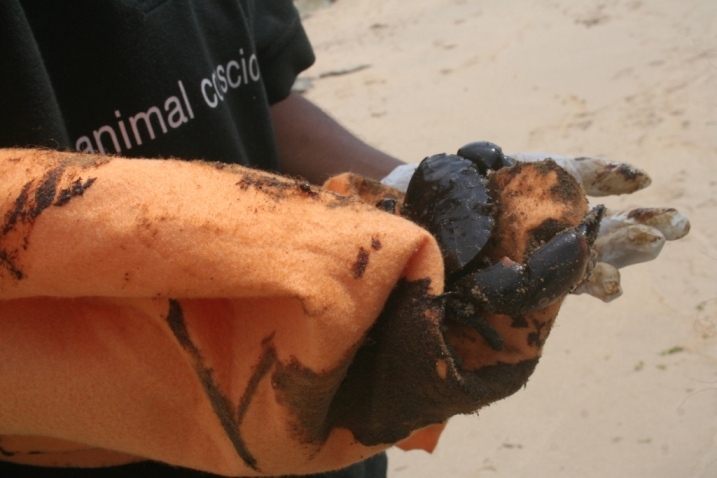 ACRES was quickly on the scene following an oil spill just offshore of Singapore, rescuing oil-covered animals at Changi Beach and East Coast Beach, cleaning them up and releasing them back into the sea at unaffected areas of coastline. For more see ACRES in the News. Part of our rescue work involves reuniting stranded baby animals back with their parents. Whether the animal may be a bird or a bat, we apply our understanding of the animal’s behavior and habitats to maximize the chances of reuniting. In 2015, we managed to get this rare footage of us reuniting a baby fruit bat back with his mum. The odds were stacked against him as he was initially found by a member of public hour’s earlier .Thanks to the caller’s efforts to keep him warm and calm, he had all the energy he needed to call for his mother’s attention when the moment came. Within seconds, the mother bat showed her maternal instincts and started hovering and flying around her baby. It was an emotional and beautiful sight to witness the mother bat risking it all to fly so low to the ground to rescue her baby and fly off. This case was a classic example of how sometimes animals just need our assistance to survive and don’t always have to be rescued and brought back. 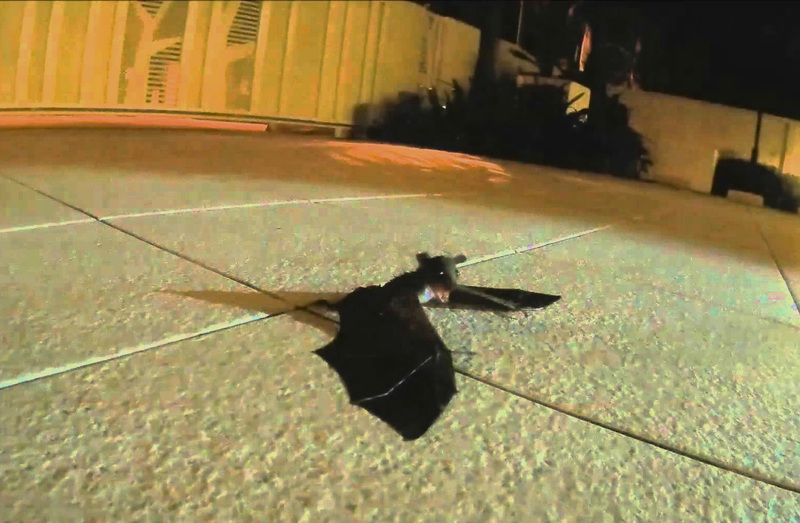 The video of baby bats reunion was ACRES’s first viral video reaching over two million views on YouTube and having been featured on websites like ONE GREEN PLANET and the STRAITS TIMES. One of the great wonders of nature is how turtle hatchlings are ‘programmed’ to make their way into the sea when they emerge from their eggs, guided by the light of the moon. Sadly, in today’s world, modern human inventions can get in the way of this ancient ritual- like a country club situated right next to the beach with bright floodlights shining at night- which, for a tiny turtle hatchling, could easily be mistaken for a moon. 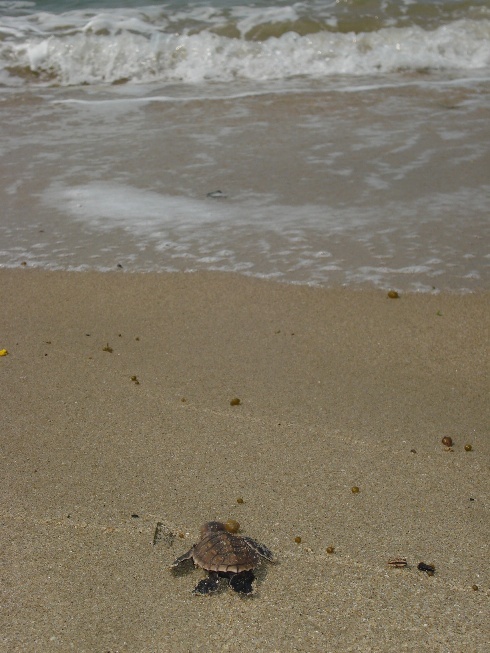 And so it was that on one morning in September 2009, scores of hawksbill turtle hatchlings were spotted scattered around the outskirts of a country club at East Coast Park. Instead of heading towards the sea, they seemed to have taken a wrong turn and had headed towards the country club, with some having come very far inland. 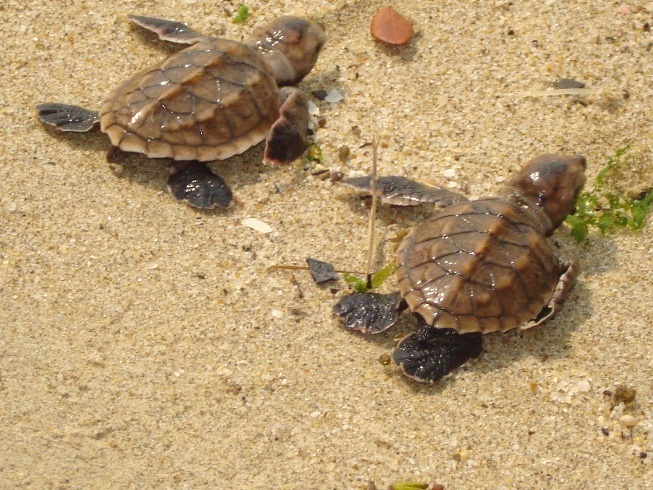 These hatchlings only have a very limited amount of stored resources, and once hatched must get to the sea quickly in order to find food and survive. After hearing that these baby turtles were in trouble, we were immediately on the way to the scene. Sadly for some, help arrived too late and they had already perished under the hot sun. However, many were still going strong- just in the wrong direction. So, together with staff from NParks and Cicada Tree Eco-place , we gently gathered up them and released them on the beach. The hatchlings knew exactly what to do and scurried away into the sea, venturing into their watery habitat for the first time. However, two hatchlings were very weak from exhaustion, one close to death, and needed emergency veterinary care if they were going to have any chance of survival. ACRES took these turtles into our temporary care at the AWRC, providing specialist care through the night and rehydrating them every two hours. Thankfully, both were much stronger by the next morning and moving around well. 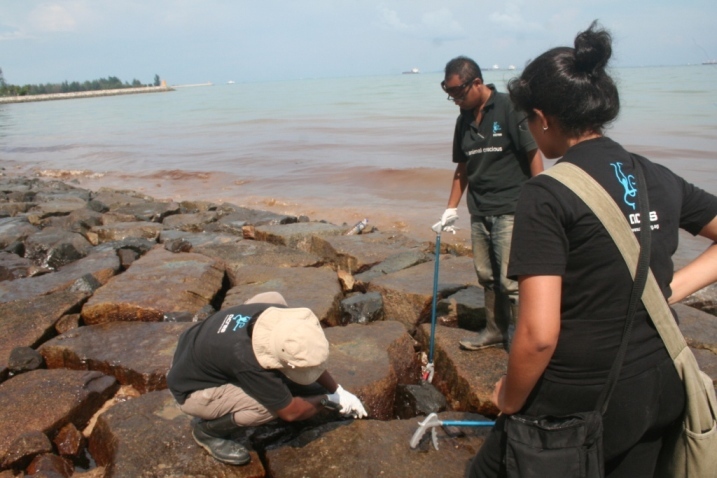 They were taken back to where they were found and successfully released into the sea. 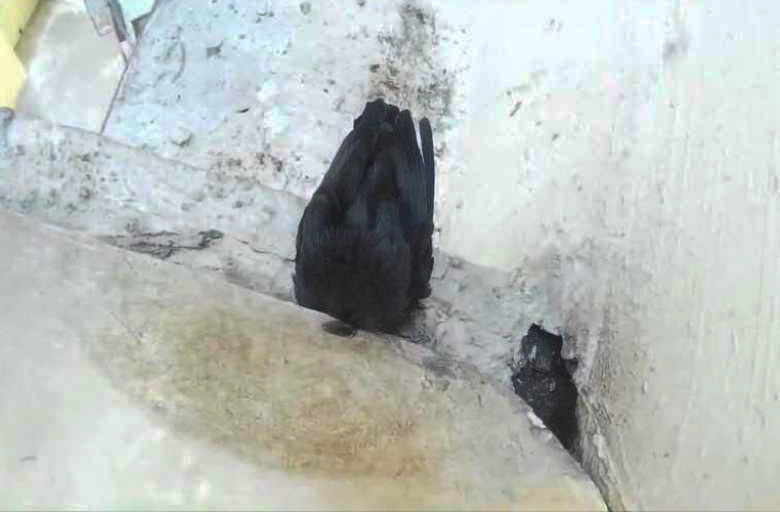 In early 2016, The ACRES wildlife rescue team received a call about a bird who got his head stuck in a crevice. The member of public found it difficult to explain the situation to us and we quickly learnt why when we reached the scene. The bird was a Javan mynah and he had gotten his head firmly stuck in a very strange and odd place. Furthermore, he had apparently been stuck there for about two days. 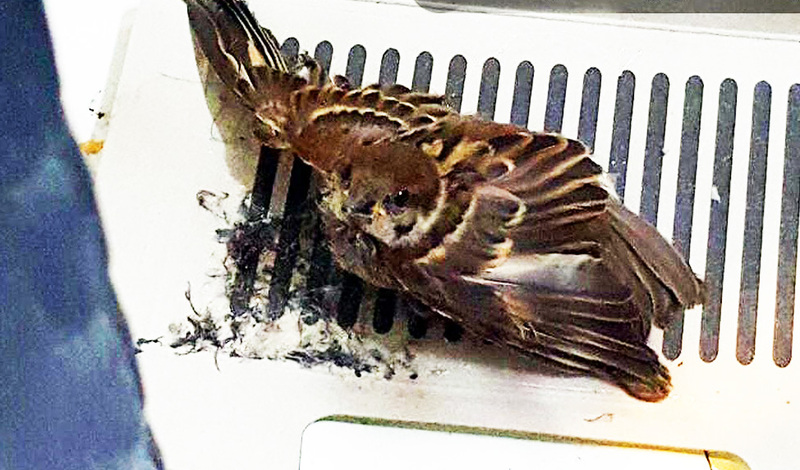 He had to be rescued quickly but our first obstacle was to get permission to enter the house in which the bird was stuck at their kitchen window parapet. Luckily, two of the kids were at home and they allowed us in. Our second obstacle was to get to the bird. He was out of our reach and climbing out of the window would be an extremely dangerous task. We spent some time brainstorming and decided to improvise and rely on our snake grabbers. The grabbers enabled us to reach the bird but we had to slowly nudge the struggling bird out and any mistakes would cause him to break his neck. We had to use all our experience to feel the bird and the crevice through the grabbers. After nearly eight minutes, we managed to make the final nudge to free him and Ostrich flew away. We are perplexed to how Ostrich got his head stuck but it is possible that he was trying to catch some insects in the crevice and go stuck. This nail-biting rescue case was featured in STRAITS TIMES. 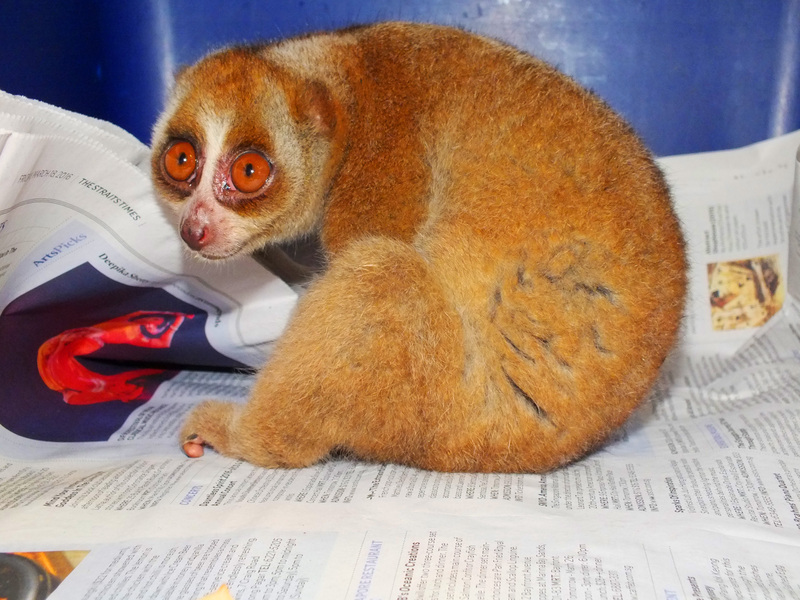 In April 2016, ACRES successfully rescued and released E.T., an endangered Sunda slow loris. E.T. was spotted by a member of public at a multi-storey carpark in Yishun. E.T. was frantically holding onto the support structures at the side of the car park and was clearly stressed. Slow lorises are forest species and the only reasons for E.T. 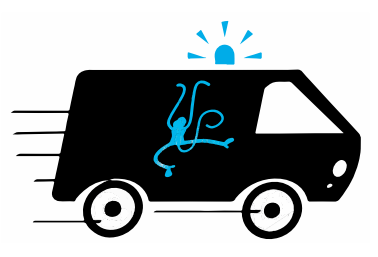 to end up at a car park was that he either was an illegal pet who escaped or a stowaway on a vehicle. After a brief rescue operation, E.T. was rescued and brought back to our rescue centre. To be able to give him a second chance to live in the wild, we had to first determine that he is a native species. We than had to observe his ability catch prey and if he still had his canine teeth. Most slow lorises in the pet trade have their canines painfully cut by pliers. Fortunately, E.T. met all the requirements to be released back into the wild. However, there was still a possibility he might not have been wild and we were nervous about releasing him. Would he remain at his release spot and seem lost? Would he approach us for comfort? Or would he take a brief moment to realize his surroundings and start climbing and be arboreal? Watch the heartwarming video below to find out! E.T.’s story was featured on Asia One and is a testament to the varied and wonderful fauna that still exists in Singapore. the most efficient manner possible. However, for Taurine’s case, we couldn’t help but be amused at Taurine’s predicament. Taurine is an equatorial spitting cobra, a highly venomous and common snake who has adapted to urban living. Due to unknown reasons, he got his entire head stuck inside a Red bull can. At first, we felt he was only slightly stuck and would break free with some slight nudging of the can but we soon realised that he was really stuck and we had to cut the can. Taurine was not very happy with his situation and we had to be extra careful when trying to safely remove him from the can. After some modifications of the can with the help of some tools, Taurine’s head could be safely removed. He sustained some superficial grazes but was definitely fit to be released. Always call our rescue hotline at 97837782 and never attempt to handling snakes like in the video below. spotted even though there are cases of them living near to urban environments. cloth to simulate a tree trunk but she was in a hurry to be released. A good ten minutes later and we found the place where she most probably crashed from. Her parents would be probably somewhere in the area as well. Would she be able to get away and hop up to freedom? Malayan colugos are fascinating animals who glide from tree to tree in search of shoots and fruits. 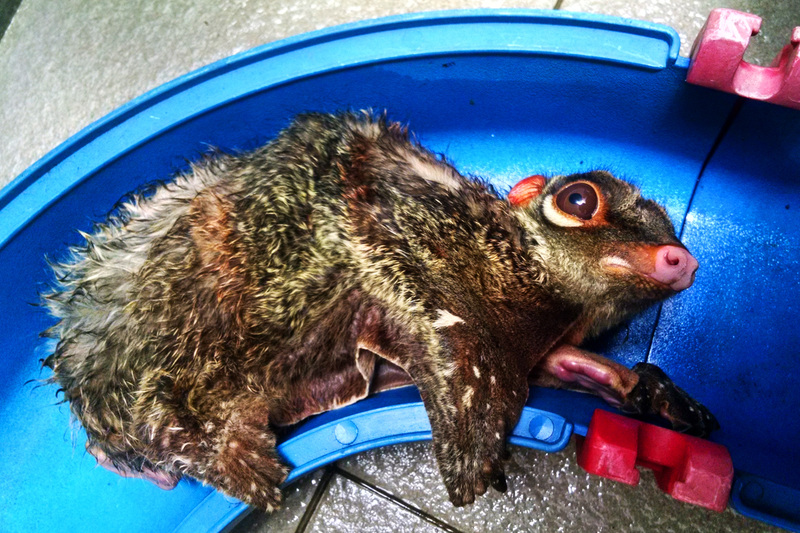 They are nocturnal animals and another species who is a testament to the varied wildlife that exists in Singapore. 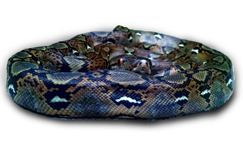 Reticulated pythons, apart from being the longest species of snakes in the world, are also one of the most versatile. 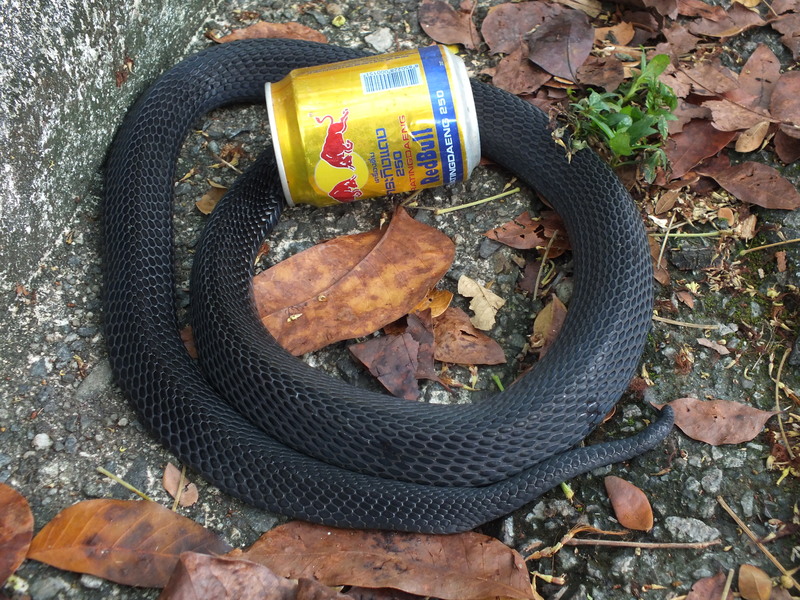 Their ability to climb, swim and adapt makes them one the snake species who have adapted to living in urban Singapore. They can be found throughout the islands often near to large drains and canals where they feed on rats and other small animals. However, they too sometimes get into trouble and need our assistance. 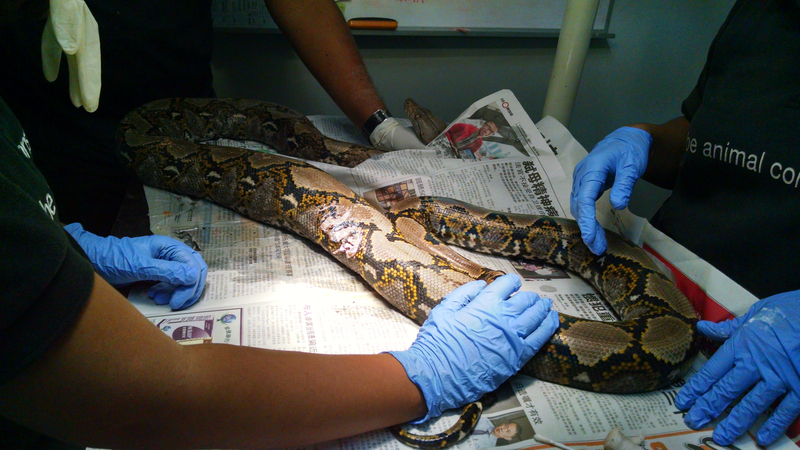 Shrapnel was a python who was spotted by a cleaner who was clearing dried leaves from the drain. Upon our arrival, a large crowd had gathered, many of whom were shocked by the sight of a snake in Singapore. Shrapnel was stuck in a sub-soil pipe inside a 1.5m deep drain. The ACRES rescue team has come across this situation before, we aren’t sure why the snakes get stuck but it could be due to air pressure which causes the surface of the snake’s body to get stuck like a suction cup. Very often, continuous careful and gentle tugging will do the trick but there was something different about Shrapnel’s case. We examined the situation and found out that the snakes body was impaled onto a piece of broken rebar in the concrete. We couldn’t force Shrapnel out as it will kill him. We had to use a variety of tools and methods to painstakingly cut the rebar before pulling him out. We managed to capture this 2-hour rescue operation on our camera. Shrapnel has since recovered from his superficial wounds and was successfully released. Our team attends to all wildlife in distress and sparrows are no different. Our wildlife rescue team received a call about a small bird who got stuck in a glue trap. Through photos, we found out that the bird was a sparrow. Sparrows get stressed easily and we had to urgently get there to rescue the bird. We requested the caller to place a cover over the bird to keep the bird as calm as possible. It was past midnight and the team was tired, but the sparrow had to be separated from the trap as soon as possible. Sparrows are very fragile birds and we had to be gentle in how we removed the bird from the trap. Watch the sweet video below to find out how we removed him and if he survived the ordeal.